Liberty Campus opened for student occupancy on January 22, 2019. This educational space is designed to meet the needs of NCA's 5-8th grade students. This 10-acre campus offers a gymnasium, chapel, cafeteria, office space, ample parking, and outdoor spaces. Classrooms are located on both floors with 5/6 on the upper floor and 7/8 on the main floor. Remodeling has been ongoing since summer 2017. Start and end times of school have been staggered to make it possible for families with multiple children enrolled at the Cox Campus to manage drop-off and pick-up of students within reasonable time frames. 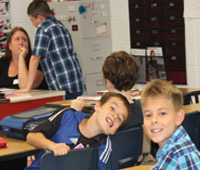 The Intermediate school student at New Covenant Academy learns in an innovative program that combines a number of rich interdisciplinary curriculum and transitional elements into a unique method for a successful transition into Jr. High school. Emphasis on a basic foundation in fundamental skills incorporates a variety of experiences to enrich each day. In Intermediate school, a student develops a love of learning and explores individual capabilities. Learning isn't limited to the classroom. Students participate in field trips and hands-on activities that promote real-world learning experiences. Along with educational activities, the students participate in a variety of community outreaches including nursing homes, and "feed the hungry" programs. The teachers are highly qualified educators who incorporate creative and innovative teaching strategies with the curriculum, challenging them to succeed. Students gain knowledge and an understanding of how all things fit together in God's plan as revealed in His Word. Time: 7:55 a.m. to 3:25 p.m. Mornings 6:30 a.m. to 7:40 a.m. Afternoon 3:30 p.m. to 6:00 p.m. Combined co-curricular to promote individuality and unity between grade levels. Co-curricular classes are Art, Music Appreciation, Computers and P.E. Click here to provide your contact information. We are happy to answer your questions!